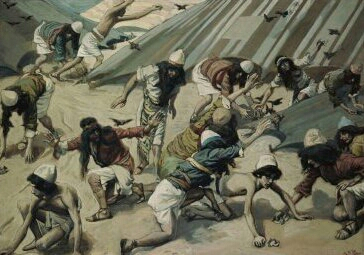 In Numbers 11, we read about how the Lord sent quail to the Israelites because they were complaining that they were tired of eating manna in the wilderness, that they lacked meat (something that contradicts the rest of the narrative). With a couple of Bible helps 1 we see that 10 homers of quail is an extreme amount of game to consume, working out to about about 1,900 birds, or 580 gallons, weighing about 475 pounds. You might assume that “he who gathered least” would be the sick, wounded, or the old (Numbers 11:32). It is noteworthy that this part of the narrative is focusing on the able bodied soldiers, so it was probably just be referring to these people. The Numbers narrative doesn’t tell us the amount for the person who gathered the most amount of quail, it only gives of the lowest number. So for simplicity we can just use the 10 homers per soldier estimate. How many soldiers are there? Each census came up about the same at 600,000. Yes, six hundred thousand able bodied men. That’s a city the size of Baltimore or Milwaukee filled with men over the age of 20 able to fight. If we assume that these men made up about ¼ the population then we’re talking about 2.4 million people, or a group of people about the size of Houston, Texas, marching across the desert of Sinai. 600,000 men times 1,900 birds per man works out to 1.14 billion birds. That is a lot of fowl. You could call that a very fowl number indeed! The Numbers narrative goes on to tell us what they did with these birds, “they spread them all abroad for themselves round about the camp” (Numbers 11:32). One person’s birds would cover the floor of a square room 15 feet on a side. These 600,000 men would have had to cover 3,200 acres with little dead quail laid side by side. If you put down these birds beak to tail they would go around the earth five times. And the Elohist author of Numbers 11 informs the reader that they spread out all these birds in one day and a night! This is a classic example of what I call “Judaic hyperbole.” It seems doubtful even the most determined family could clean and cook almost 2,000 birds before they went rotten. How much is 1 homer? A homer (Hebrew: ‎‎ חמר; also kor, Hebrew: כּר‎‎) is a unit of volume used by ancient Hebrews for liquids and dry goods. 1 homer is equal to 10 baths, or what was also equivalent to 30 seahs; each seah being the equivalent in volume to six kabs, and each kab equivalent in volume to 24 medium-sized eggs. 1 homer equals 220 litre or 220dm3, or about 58 gallons! The homer should not be confused with the omer, which is a much smaller unit of dry measure. The Mishnah (ed. Herbert Danby), Oxford University Press: Oxford 1977, Appendix II, p. 798. This entry was posted in Messiness of scripture, Old Testament and tagged Judaic Hyperbole, Messiness of scripture. Bookmark the permalink.